Crete Holiday Villas welcomes you to sunny and beautiful Crete, an island of unique and unforgettable experiences. Our company offers high quality accomodation services in Crete, providing high quality holiday villas and apartments for rent in low prices and special internet offers. Crete is the largest of the Greek islands and the fifth largest island in the Mediterranean Sea at 8,336 square km (3,219 square miles). It was the center of the Minoan civilization (2600–1400 BC), the oldest Greek and European civilization. For centuries the island was known by its Italian name Candia, from the medieval name of its capital Heraklion, Chandax. In Classical Latin it was called Creta and in Turkish Girit. Crete is the location of significant ancient history, which provides popular modern day tourist destinations. They include the Minoan sites of Knossos and Phaistos, the classical site of Gortys, the Venetian old harbour of Chania, the Venetian City of Chania, the Venetian castle at Rethymno, and the Samaria Gorge. Today Crete is one of the thirteen peripheries of Greece and a significant part of the economy and cultural heritage of Greece. While it keeps its own local cultural traits (e.g. its own music and dialect), Cretans openly identify themselves as Greeks. Crete, with a population of 650,000 in year 2005, is one of the 13 regions into which Greece is divided. It forms the largest island in Greece and the second largest (after Cyprus) in the East Mediterranean. The island has an elongated shape: it spans 260 km from east to west and 60 km at its widest, although the island is narrower at certain points, such as in the region close to Ierapetra , where it reaches a width of only 12 km. Crete covers an area of 8,336 km², with a coastline of 1046 km: to the north it broaches the Sea of Crete, to the south the Libyan Sea in the west the Myrtoan Sea, and toward the east the Karpathion Sea. It lies approximately 160 km south of the Greek mainland. Crete is extremely mountainous, and its character is defined by a high mountain range crossing from West to East, formed by three different groups of mountains. These are: the White Mountains or Lefka Ori (2,452 m), the Idi mountains or Psiloritis (2,456 m), the Dikti mountains (2,148 m), etc. These mountains gifted Crete with fertile plateaus, such as Lasithi, Omalos and Nidha; caves, such as Diktaion and Idaion; and gorges, such as the famous Gorge of Samaria. 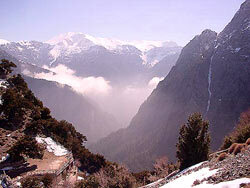 The protected area of the Samaria Gorge is the home of kri-kri, while Cretan mountains and gorges are refuges for the endangered vulture Lammergeier (Gypaetus barbatus). 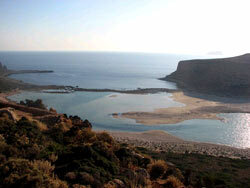 There are a number of rivers on Crete, including the Ieropotamos River on the southern part of the island. Crete straddles two climatic zones, the Mediterranean and the North African, mainly falling within the former. As such, the climate in Crete is primarily temperate. The atmosphere can be quite humid, depending on the proximity to the sea, while winter is fairly mild. Snowfall is common on the mountains between November and May, but rare at the low lying areas, especially near the coast when it only stays on the ground for a few minutes or hours. However, a truly exceptional cold snap swept the island in February 2004, during which period the whole island was blanketed with snow. During the Cretan summer, average temperatures reach the high 20s-low 30s Celsius (mid 80s to mid 90s Fahrenheit), with maxima touching the upper 30s to mid 40s (above 110 Fahrenheit). The south coast, including the Messara plain and Asterousia mountains, falls in the North African climatic zone, and thus enjoys significantly more sunny days and high temperatures throughout the year. In southern Crete date palms bear fruit and swallows remain year around, not migrating to Africa. The economy of Crete, which was mainly based on farming, started changing visibly during the 1970s. While there is still an emphasis on farming and stock breeding, due to the climate and the terrain of the island, there is a drop in manufacturing and a big increase on the services industry (mainly tourism related). All three sectors of the Cretan economy (agriculture, processing-packaging, services), are directly connected and interdependent. 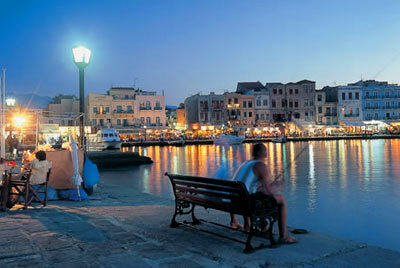 Crete has an average per capita income which is close to 100% of the Greek average. Unemployment is at approximately 4%, half of that of Greece. As in other regions of Greece, olive growing is also a significant industry. The island has three significant airports, Nikos Kazantzakis at Heraklion, the Daskalogiannis airport at Chania and a smaller in Sitia. The first two are international serving as the main gates to the island for thousands of tourists. Crete is one of the most popular holiday destinations in Greece. Fifteen percent of all arrivals in Greece come through the city of Heraklion (port and airport), while charter journeys to Heraklion last year made up 20% of all charter flights in Greece. Overall, more than two million tourists visited Crete last year, and this increase in tourism is reflected on the number of hotel beds, rising by 53% in the period between 1986 to 1991, when the rest of Greece saw increases of only 25%. Today, the island's tourism infrastructure caters to all tastes, including a very wide range of accommodation; the island's facilities take in large luxury hotels with their complete facilities swimming pools, sports and recreation, smaller family-owned apartments, camping facilities and others. Visitors reach the island via two international airports in Heraklion and Chania, or by boat to the main ports of Heraklion, Chania, Rethimno, and Agios Nikolaos.